I decided that I would replace all of the bushings since I had the subframe out. When ordering bushings, the 2 front and 2 rear are the same, while the 2 middle are slightly different. The process to remove and install the bushing is basically a pulling technique. A threaded rod is used to pull a socket into a receiving socket. I would recommend a 1/2" threaded rod for it's strength. We did use a 3/8" rod for most of the bushings though. You may need to purchase or get creative about finding sockets with the right diameters. I will try to hightlight the sizes I used as a starting point. Removing the subframe bushing is a two step process. First, you remove the rubber center section. Second, you remove the outer sleeve. 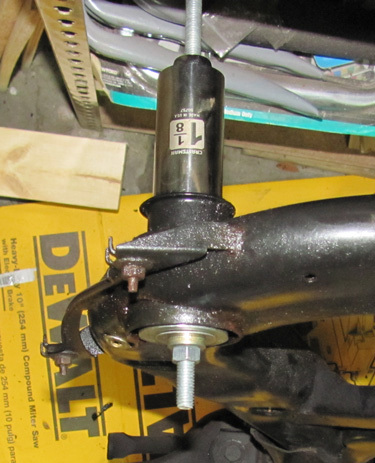 To remove the rubber center you place a receiver socket on the top side of the bushing. The receiver socket should surround the rubber top. Insert the threaded rod down the middle and then use a washer and nut on the bottom. As you tighten the nuts, the bottom of the bushing will be pulled into the receiver socket. To remove the outer sleeve from the subframe, you place the receiver socket on the bottom of the subframe. Using a new bushing, make sure the sleeve can fit inside the receiver socket. Then use a socket that just fits the subframe hole at the top. This was a 1-1/8" socket for me. As you tighten the nuts, the top socket will get pulled down and force the sleeve into the receiver socket. Installing the bushings is a little more tricky, although the process is exactly the same. The hardest part is getting the rubber part of the bushing inside the subframe hole without damaging it. First use some petroleum jelly or soapy water on the rubber. This will make sure the rubber slides easily and does not bind. Make sure the rubber top easily fits inside the receiver socket. The pushing socket should sit on the lip of the sleeve. Do not try to pull the bushing up from the center. You will rip the bushing apart! 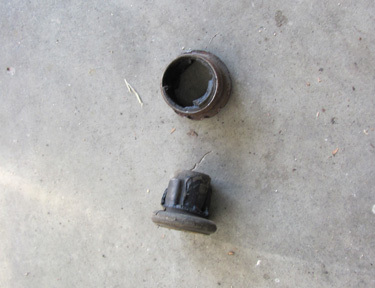 As you start to press in the bushing you need to be very careful that rubber is not getting stuck anywhere. I usually wiggle the socket around and force the edges up into the hole. Once I feel that it is good, I just tighten down the socket.